Decorative mirror on the wall or over your dresser is an attractive ad functional home accessory that enrich traditional or modern interior design and decorating. 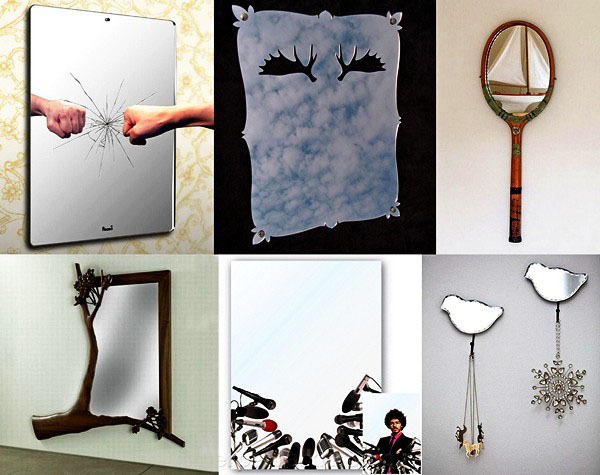 Our decorative mirror collection presents interesting and unusual mirror stickers and creative wall mirrors. Since a caveman looked into a placid lake water and saw the reflection, people have been infatuated by reflecting effects. Decorative mirror is one of the most important home accessories that define modern interior design and decorating. While wall mirrors and mirror stickers tell you how you look and what is around you, that depends on your interpretation of what you see in a decorative mirror. Small mirror stickers or large wall mirrors simply reflect images, bringing more light into interior design and decorating. How you interpreter the reflections is up to you. Contemporary mirror stickers and wall mirrors become an integral element of modern interior design and decorating. A decorative mirror is a part of any room design. Aside from the common use, large wall mirrors create the illusion of more spacious interior design. Strategically placed large wall mirrors can make any room look larger. Contemporary mirror stickers and wall mirrors are especially good for small interior design and decorating, creating brighter and bigger rooms they add interesting decorative accents. Combined with proper lighting design, a decorative mirror can transform a lacking interest room into lighter, brighter and more exciting space. Contemporary mirror stickers and wall mirrors, enriched by creative design and unusual ideas, are great home accessories for creating illusions that make modern interior design surprising and change your perceptions. A large decorative mirror, small mirror stickers or a collection of unique wall mirrors can be used to enhance your interior design and decorating ad add more fun to your life. Although mirror stickers and wall mirrors can’t speak like the Magic Mirror from Snow White, they can tell you a lot about yourself. Look at the decorative mirror collection and see what you like.